The OASIS coupler allowing synchronized exchanges of coupling information between numerical codes representing different components of the climate system. Currently, it is developed by Centre Européen de Recherche et de Formation Avancée en Calcul Scientifique (CERFACS) and Centre National de la Recherche Scientifique - Institut Pierre Simon Laplace (CNRS-IPSL). OASIS3-MCT is the third version of the OASIS coupler interfaced with the Model Coupling Toolkit (MCT) from the Argonne National Laboratory. It offers today a fully parallel implementation of coupling field regridding and exchange. The successor version will be OASIS3-MCT_4.0. 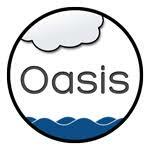 Access to OASIS and the support services via the ENES portal.